At Partridge Events they know it is important to make a splash. Their bespoke events are always stylish, decorative and create the right kind of ambience. From stunning grown up affairs through to imaginative children’s parties, they ensure your event fulfils your every expectation. My favourite restaurant would have to be Randal & Aubin in Soho: amazing seafood, the staff and waiters always add to the experience, along with the rather cool house music – a great night out! 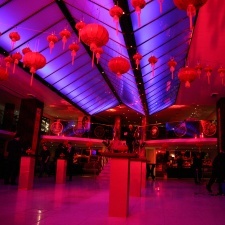 For the last six years we have been helping create amazing Chinese New Year celebrations for CLSA at a variety of locations in London; In 2011 it was at Quaglinos, Restaurant, Mayfair. We created two sets, a slick conference set for the day that magically transformed for the evening into a stunning Chinese New Year party.